Size: 5.6" x 2.8" x 0.45"
The French TI-40 Collège is very similar to the TI-32 Explorer Plus sold in US but lacks the solar cells. The housing itself is unique within the scientific line, the TI-40 Collège combines the keyboard arrangement of the TI-32 Explorer Plus with the shape of the TI-30Xa Solar. Dismantling this calculator manufactured by Nam Tai Electronics, Inc. in June 1997 reveals a typical "far-east" design with a single-chip calculator circuit in COB-technology. 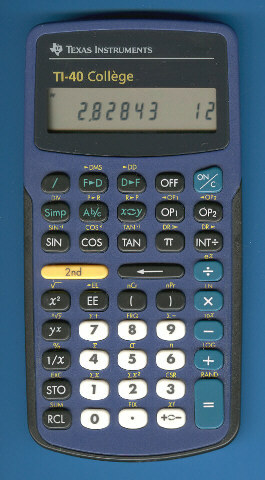 In 1999 Texas Instruments introduced a complete line of advanced two-line calculators and once again France got an unique model sporting the "French fractions", don't miss the TI-40 Collège II. © Joerg Woerner, June 29, 2003. No reprints without written permission.